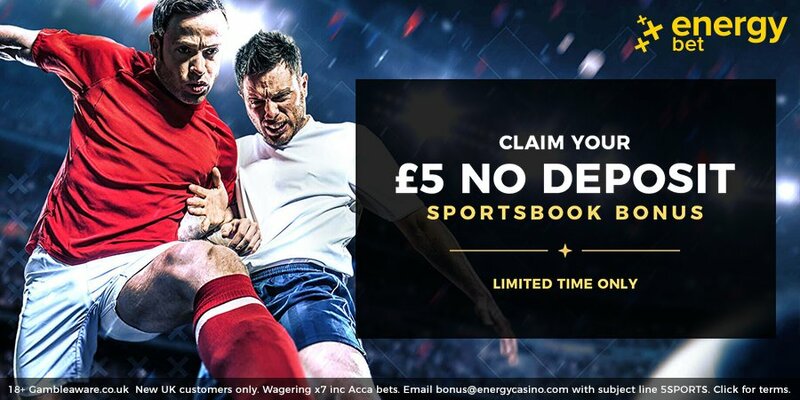 EnergyBet £5 No Deposit Betting Bonus! Claim Your Free Bet! EnergyBet is an online sports betting site which has been launched by the well-known online casino Energy Casino. Register a new account today and claim your £5 no deposit bonus! Hurry up! This is a limited-time exclusive offer for Bet&Skill readers! Energy Bet have launched a well-designed modern looking website with an impressive selection of sports available to bet on, including a very good selection of live in-play betting. Open a new EnergyBet account right now and take advantage of this promotion! Energy Bet is becoming an increasing presence in the UK as a result of their shirt sponsorship of Leyton Orient and through being the betting partner of Aston Villa. Energybet has already attracted a great number of customers, and this is largely due to the fact that this is a provider that offers a massive amount of choice in terms of sports to bet on. There is a total of 36 different markets, so whatever you’re looking for, you will be able to find it at Energybet. Can I Claim More No Deposit Free Bets? Of course you can! BetAndSkill is the website offering more completely free offers on the Internet! 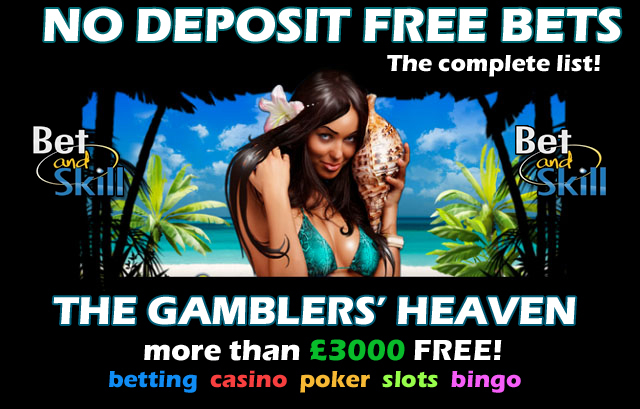 Just check our great free bets no deposit page and start gambling online with no risks attached! What are you waiting for? This promotion is only valid for the newly registered EnergyBet customers who registered using special promotion links and banners. The bonus amount is £5. The offer is valid from 19.07.2018 00:01 CEST until 31.12.2018 23:59 CET and cannot be used in conjunction with any other promotion. The bonus is only available to customers from United Kingdom. Bonus can only be claimed once per person, household, family, household address, email address, IP address or shared computer environment. The use of VPN, proxy or other services and techniques, for the purposes of deliberately obscuring, hiding or changing IP addresses in order to fraudulently take advantage of bonus or promotional offers is strictly forbidden. Wagering requirements for the no deposit bonus: seven (7) times turnover of the bonus amount, only accumulator bets with final odds of minimum 3/4. Minimum odds for each event 1/4. Return and voided bets do not count towards wagering requirements. Players can withdraw up to £50 from the bonus amount granted after the wagering requirements have been met. Everything above this amount will be removed. Winnings from the no deposit bet can only be paid out to a bank account only registered on the customer's name. When the customer submits his first request for withdrawal, EnergyBet will require from the customer to provide proof of identity and address. Bets placed on different selections within same market or bets placed on equivalent markets (eg. Double Chance and (Asian) Handicap bets +1/-1) are not eligible for this offer. If such bets are placed, EnergyBet reserves the right to close relevant accounts and confiscate existing funds. EnergyBet reserves the right to disqualify any player from this promotion if evidence of abuse or fraud is found. In the event of any dispute, EnergyBet management’s decision will be considered final. EnergyBet reserves the right to change the terms and conditions of this offer at any time and it is the customer’s responsibility to check for changes and updates. Management reserves the right to remove or change this promotion at any time at its own discretion. General Terms & Conditions of EnergyBet apply. All bonuses and promotional offers are intended for recreational players only. EnergyBet reserve the right to, at their discretion, limit the eligibility of customers for any bonuses and offers. Customers have 30 days to turn over the bonus funds otherwise their bonus balance will be forfeited. Bets made using Bonus Funds must be settled within the original validity period of those funds. The results of any such bets settled after their expiration will be lost. Unless in Newsletter specified otherwise. Upon completing the Bonus Funds turnover wagering requirements, you should allow 20 minutes from when the last open bet, placed with the Bonus Funds, was settled and results published, before any real money winnings will be redeemable. To transfer Bonus Money to actual balance, all bets that were placed using Bonus Money must be settled and final event results must be published. Return and voided bets do not count towards wagering requirements. The EnergyBet and EnergyCasino bonuses are separate bonuses. The EnergyBet bonus cannot be used at EnergyCasino and vice versa. We offer you an option to forfeit your bonuses. To do so, you will need to contact customer support. However please be aware that if you forfeit a bonus before completing any required wagering, the bonus along with any additional accumulated winnings will be removed. Energy Casino €/£5 free bonus - no deposit required! "EnergyBet £5 No Deposit Betting Bonus! Claim Your Free Bet!"